We love you Dupont and we know you know trivia! 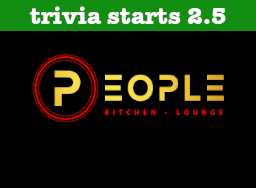 Starting this Tuesday (2.5), we'll be hosting trivia at People Kitchen! Because it's People Kitchen, that means you'll only have to be the top team for one month and you'll qualify for the $5000 Tournament of Champions finals! Trivia starts at 7:30pm this Tuesday - don't miss it and we'll see you at People Kitchen!